** I try to write a survey of Prague's burgers every year. Here's a more recent list. Yes, I know the feeling. A very fine hamburger really gets my heart racing. In a good way. 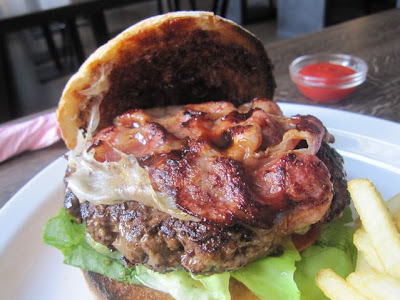 With the build up in my archives, if not my arteries, I feel it's time again for another installment of my ad hoc, unscientific survey of the burgers of Prague. 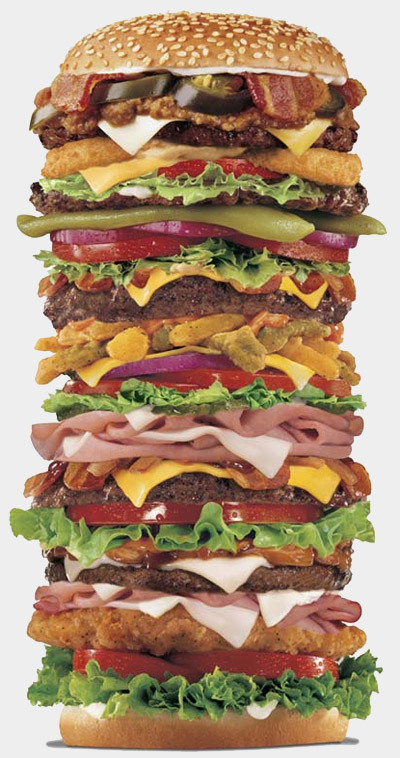 The 2008 list had 10 burgers, the 2009 list had 16. This year's has 21. I ate all these in the last year, and I'm still only nibbling at the surface. Prague has turned into a big burger town. There are plenty I've missed, some of them possibly even good. I'll repeat what I've said in the past: This is not a list of the "best" burgers. It is a purely subjective survey of the ones I either liked or disliked the most. As they say on Wall Street, past performance is no guarantee of future returns. I always take value for money very seriously. But in the case of this study, I put more emphasis on flavor and classic construction. After all, when the price of your vice goes up, what do you do? You complain about it. Then you pay the price. 21. El Barrio de Ángel Oh, how the mighty have fallen! 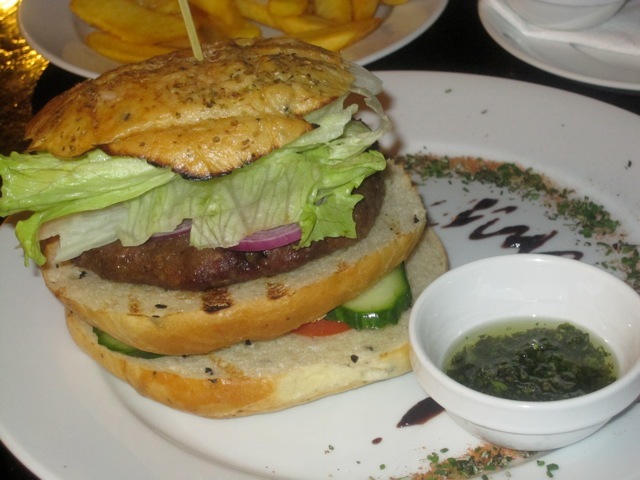 Last year, This South American steakhouse's burger (179 CZK) was flying high at #4. Now it's dead last. What happened? First, of all, they ditched the standard bun for one that seemed to be made of rubber used from a dog's chew toy. They sliced it into three sections. Top level was filled with overcooked, dense meat with no grill flavor, along with onions, and lettuce. The bottom level was devoted exclusively to cucumber and tomato. I just ate the top layer, and it was an unpleasant experience. Fries were not included. 20. Hooters The regular burger was 195 CZK, but bacon and cheese are an extra 15 CZK each. 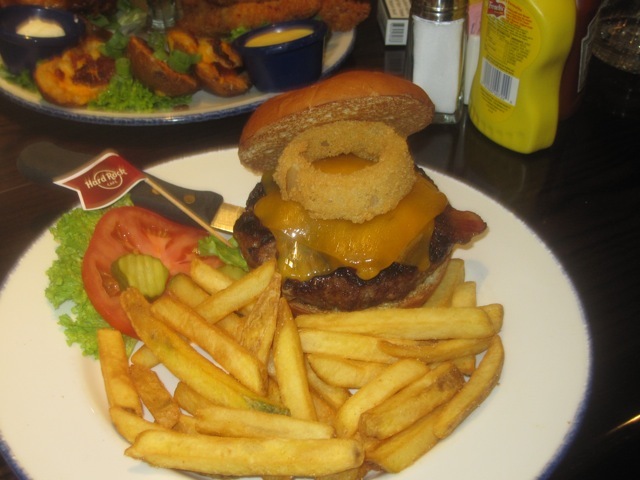 Instead, I had Hooters BBQ burger, which comes with both (229 CZK). There was a huge patty, but it had a rubbery texture that didn't taste like pure ground beef. It had a perfectly circular shape and smoothness. It appeared to be machine-formed and then frozen at some point. 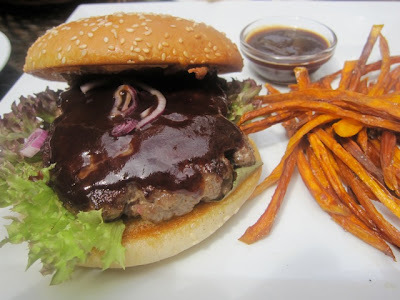 With the BBQ sauce and raw white onion, the burger had a familiar flavor I couldn't place at first. Finally, after much memory searching, it came to me. It tasted exactly like the long-discontinued "McRib" pork sandwich from McDonalds! One would think it was discontinued for a reason. Burgers come with either coleslaw, baked beans or potato salad, but fries cost extra. 19. Cafe Bar Wigwam I spend a lot of time at the Wigwam, and I used to get the Jalapeno Burger a lot (145CZK). But I just can't take it anymore. The over salted, overcooked, crumbly beef sits on small, dry bun that is slathered in mayo. It usually breaks apart in your hands. The bacon is soft, English-style. The jalapenos help make it bearable, but just barely. The large steak fries that come with it are oddly chewy. 18. 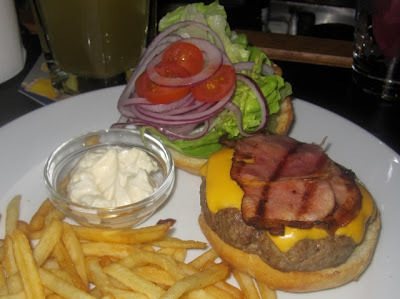 Crazy Cow Steakhouse The Crazy Cow Sirloin burger (139 CZK) did not come with bacon, cheese or fries. The quality of the meat itself was good. But it was salty, over-seasoned, and overcooked. I don't like raw red and green peppers on my burgers, but those were easily removed. I'm not a big mustard on burgers fan, and unfortunately, that was not possible to take off. 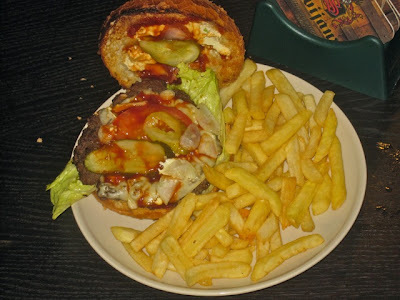 The top of the bun was soaked in a watery red sauce. The parts of the bread that weren't waterlogged were so dry that they cracked apart in my hands. Fries were not included. 17. Baterka The Maxiburger (159 CZK) is an oddity. It's the only burger I've ever seen that is delivered to the table sliced in half. That in itself is not a problem. It's otherwise well-constructed. It's even one of the few burgers to be served medium-rare. However, it has one major fault: despite the good meat and all the toppings, it was unforgivably bland. It tasted like nothing. There was no grill flavor at all. There was a desperate need for salt in the meat. The included fries were good, hot, and crunchy. 16. Dock House I had high hopes for this pricey steakhouse's Dock Burger (193 CZK). But it seemed like a cheap cast-off. This was the smallest patty I've seen in Prague outside of McDonald's. It was tough and cooked all the way through, despite my request for medium. The flavor was not bad, but there was only the smallest hint of the grill. 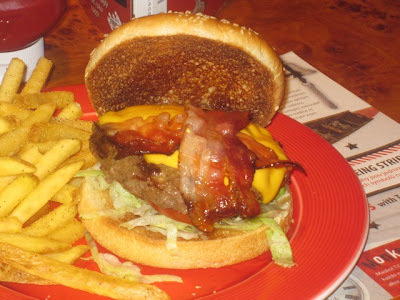 The bun was loaded with toppings - onion, pickle, lettuce, and tomato, along with rather indistinct bacon. Real Cheddar cost extra (25 CZK). But the mass of toppings drowned out the ground beef. It came with good-quality steak fries. 15. 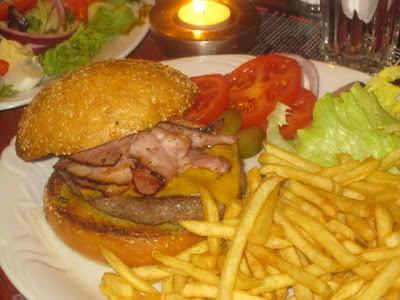 The Gate The meat of the "York Bacon Burger" was overcooked and bland (165 CZK). I never did a full write-up on the restaurant, but I checked my notes, and they said "burger very average." The bacon was soft, English-style without much smoky flavor. There was an indistinct white cheese. Grilled onions were a nice touch. They use the big chewy bun that is increasingly common around town. It came with bad, limp fries. 14. Butch's Burger The Big Queen's burger (79 CZK) is the one that comes with bacon and cheese. This big burger certainly gets points for value. 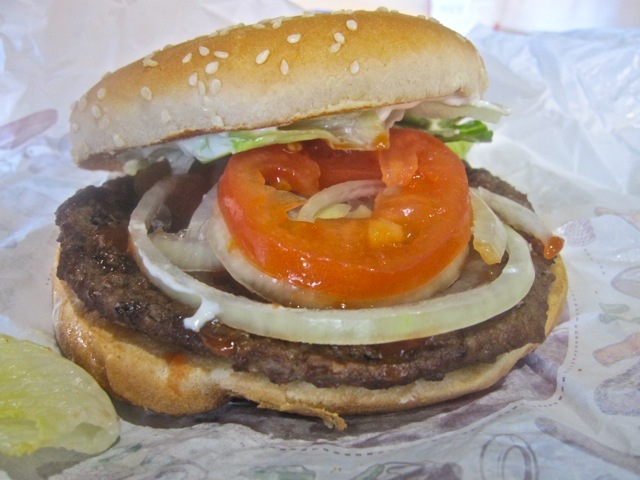 It also comes with lettuce, tomato, fried onion, cucumber, and a ketchup-mayo mixture on a big, chewy, sturdy bun. I'd always ask them to leave off the cucumber (though sometimes they'd forget). When the place first opened, it wasn't half bad. But the last time I went, the meat was pre-cooked and then reheated to save time. Sure, Burger King does it, but it dries out the beef and hurts the quality. 13. Burger King I included The Whopper last year as an amusing control for this experiment, and I do so again. I assume most of you know what this tastes like. I've always been a Whopper fan, but I will say that on recent, close consideration, the flame-broiled, then microwaved patty was very dried out. I don't mind mayo on it, but they always put too much. Great fries sold separately. There are quite a few burgers below The Whopper line this year. If given a choice, I'd rather have a Whopper than any of those burgers listed above. Quality seems to be dropping, almost across the board. 12. Prague Beer Museum Pub Because this pub has no kitchen, the cheeseburger (150 CZK) at this pub actually comes from Fasty's, a Czech fast food place around the corner. On the large, toasted sesame seed bun, there was a dry, salty beef patty. Mixed together on top was lettuce, tomato, pickles, onions, melted cheese, mayo, and barbecue sauce. The bun was chewy, but held together well considering the large variety of toppings. It was big, filling, and relatively cheap. It was something like Burger King quality, but with no flame broiling. There was a massive amount of fries, but they lost heat and crispness during their travels in the Styrofoam. 11. Potrefená Husa on Vinohradská This bacon cheeseburger (248 CZK) came in second last year. I still give this burger points for serving the lettuce, tomato, and onions on the side, away from the hot beef. The toppings were carefully cut and trimmed to fit on the toasted bun. That's very thoughtful and shows attention to detail. The smoked bacon has great flavor, but was soft and almost like ham. The big issue was the beef. They used excellent quality meat, but it was actually too good. I believe they use the same very lean beef that is used for their beef tartare. 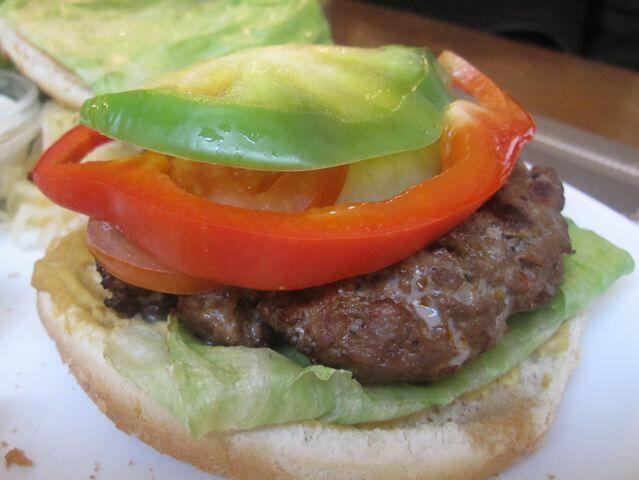 Good hamburger meat should have about 20 percent fat, and this one's content is too low. It dries out when cooked. They also usually cook the thick patty all the way through. Also there was an almost complete lack of seasoning. The bland meat desperately needed a shot of salt. The included fries were good, but they always have too many short, stubby ones. 10. 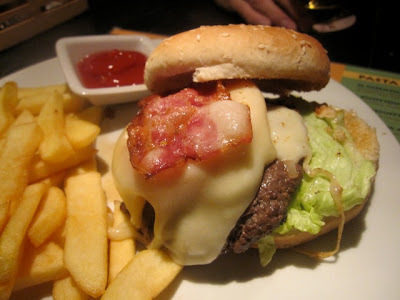 TGI Friday's The Bacon Cheeseburger is 249 CZK at the Anděl location. At the Na Příkopě and Karlova locations, it is 295 CZK. Given its American provenance, I always have high expectations for burgers from this chain. They flame-grill their big patty, which is a big plus for me. The bacon is crispy, American-style and very good. But one big mistake is putting the cold lettuce and tomatoes under the beef. The meat cooled off, and the toppings (or should I say bottomings) got warm. 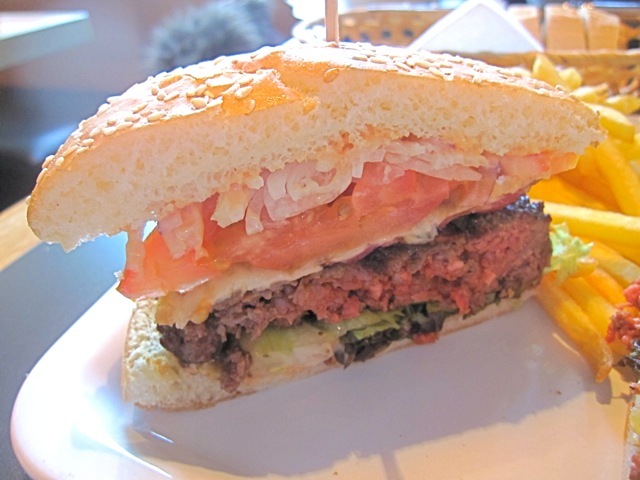 For some reason, whenever I eat this burger, the big, standard sesame seed bun falls apart. A downfall of this burger, for me, is the liquidy, salty, Cheez Whiz-like stuff that seeps into every crevice and dominates the flavor. The great, partially-skinned fries were included in the price. 9. U Malého Glena This jazz club also does decent a good bacon cheeseburger (165 CZK). It was very similar to the burger of its sister restaurant, Bohemia Bagel in Holešovice. They use the same type of beef patty, and same toasted, buttered sesame seed bun. But there are a number of differences. I credit them for putting the topping on the side. I take credit away for using soft, floppy, English-style bacon. Also, the beef lacked the flavor of grill smoke, but instead had a buttery, greasy taste. The McDonald's style fries were good. I actually liked them better than the homemade ones at Bohemia Bagel in Holešovice. 8. Rocky O'Reilly's Rocky O'Reilly's bacon cheeseburger (285 CZK) was pretty good. They used a generous amount of quality ground beef which is lightly salted and got some flavor from the grill. Their smoky bacon was English-style, but cooked enough to achieve some crunch. However, there were a few negatives. The lettuce and tomato sat under the patty. The cheese didn't have much flavor beside salt. And the patty, while juicy on the outside, was cooked all the way though and a bit dry in the middle. 7. Jáma Steakhouse The Jáma Steakhouse Burger is 165 CZK. Adding bacon cost a whopping 45 CZK, and adding real cheddar was another 45 CZK. 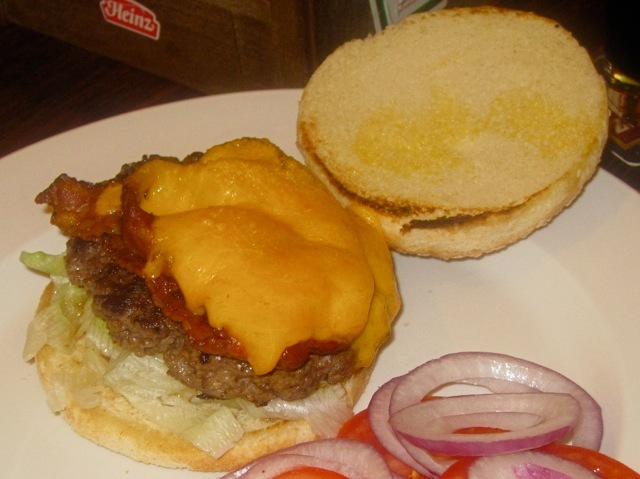 The patty was formed with good quality ground beef and was simply seasoned with salt. It was one of the only patties to have a fat, round shape like you'd get at a backyard barbecue. It'd didn't have char-grilled flavor though and tasted like it was cooked on a griddle. I asked for the burger medium-rare, but it came medium-well. The bacon was too hard and crispy for me, and the tomatoes and onions were cut too thick for good placement on top. The steak fries were good and crispy. 6. Artisan Restaurant & Cafe The Artisan hickory burger (230 CZK) was a favorite. It comes with smoked bacon, red onions and cheddar on a sesame bun. The beef, with a nice char on the exterior, was a real star. The sesame bun was perfectly toasted. What kept this particular burger from scoring even higher was that despite its outer char, it was much too rare on the interior. There was too much raw meat in the middle. The included sweet potato fries were greasy and rather flavorless. 5. 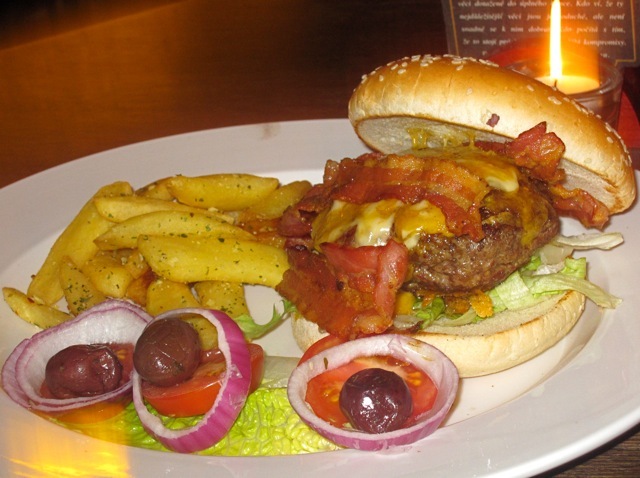 Cowboys The Cowboys sirloin burger (345 CZK) comes with thick, crispy bacon, melted cheese, chopped pickles, tomato slices, and mixed, leafy lettuce. The salty meat had a good texture, wasn't over-seasoned, wasn't overcooked, and had the right charbroiled flavor. The great beef sat upon on a large, toasted, Burger King-style bun. I gave them points for putting the toppings on the side. An American friend who tried it with me called it "a damn good burger." It came with excellent, crispy, homemade French fries. We liked just about everything about it except the price. 4. 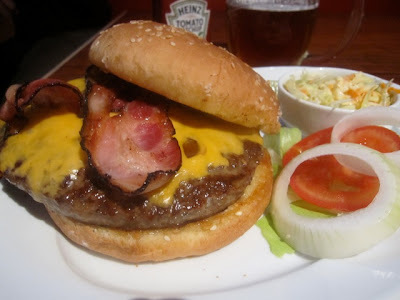 Belushi's I had the barbecue bacon cheeseburger (195 CZK). It cost the same as the regular bacon cheeseburger, so I figured why not get the extra sauce? This burger was very well put together. A few things stand out. The bun was excellent and different than most others. It was well-toasted and warm, with a lightly crispy exterior and a soft interior. It had good integrity and held up to the big patty. The patty was also different than most. The meat was good, but quite peppery. It's not a classic taste, but I liked it. While it was juicy, I thought the patty was cooked too long, and didn't get much flavor from the grill. The bacon was more English than American, but it was cooked long enough that it achieved some crunch. The long, thin McDonald's-style fries, included in the price, were excellent -- hot and crispy. 3. 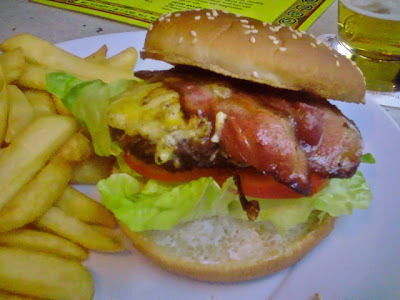 Jáma Bar and Grill The Jáma Bar and Grill burger starts out cheap but gets to 210 CZK with bacon and cheese. It looks basic, but sometimes simple is better. The quality, real Cheddar is expensive, but it makes a big difference in the flavor. Most cheeses in this survey just taste like yellow, salty, goo. The bacon was good. 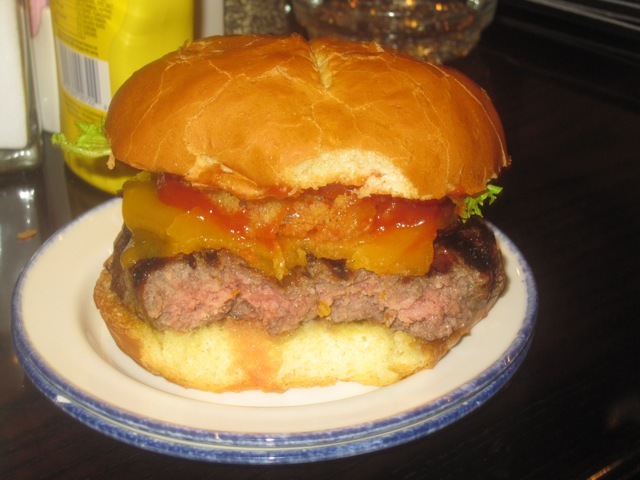 The quality patty, seasoned with salt, tasted pan-grilled. It still picked up some nice flavor in the cooking process. I'd fault them for putting the cool lettuce under the hot meat. Tomatoes and onions were sliced nicely and put on the side. Fries were not included in the price. 2. Bohemia Bagel in Holešovice This was last year's winner -- the Bohemia Burger with bacon and cheese (155 CZK). But the quality dropped. Due to its champion status, this was the only burger I gave a second chance to after a bad, overcooked one I had a few months ago. I tried it again last week, and it was much better. 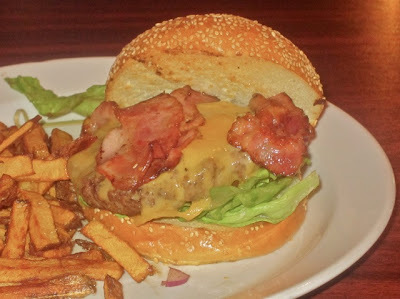 This one had juicy, smoky ground beef, and a generous amount of crisp, smoky bacon. The good meat and the flavor of the grill help set this one apart. Its faults were that the toppings, the lettuce, tomato, and onion, were under the hot patty, which makes them hot and wilted. There was too much lettuce. The salty, yellow cheese doesn't have much flavor. I asked for it to be cooked medium, and it was cooked all the way through. The construction was sloppy, with the tomatoes and onions falling off to once side. I still take off points for inconsistency in preparation. The included fries are homemade, but small, oily, and not very crispy. Despite all this, it is the best value for money burger in town. 1. Hard Rock Cafe I'll admit I didn't want to like the "Legendary 10 oz. 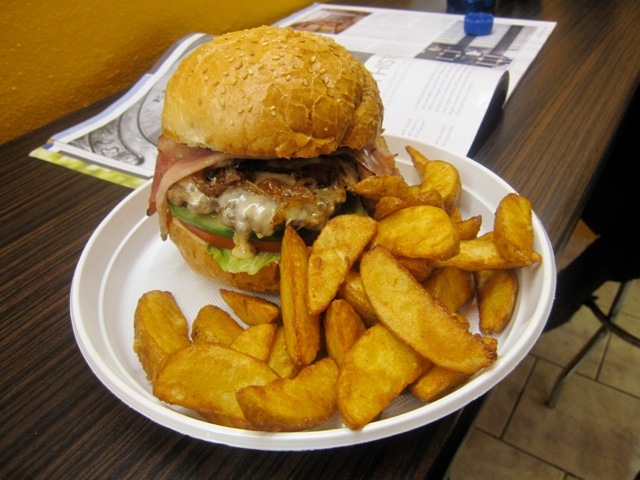 Burger" (325 CZK). I certainly didn't like the price. If I have a bias, it is toward underdog burgers. 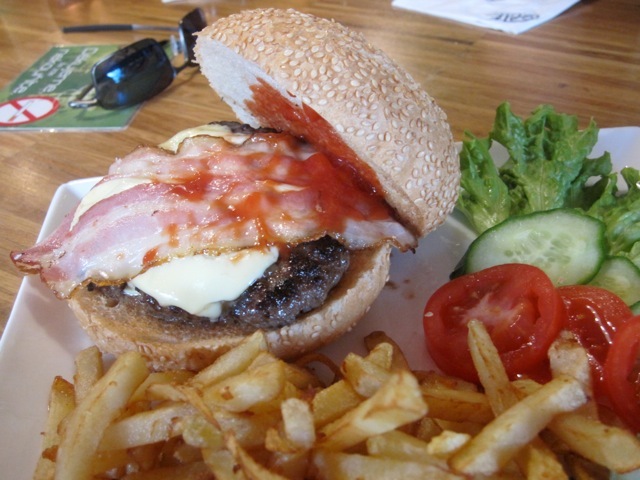 But I couldn't deny it: to my mind, this burger hit every classic note. I enjoyed every bite of the thick, char-grilled patty, cooked to a perfect medium as requested. On top was real, crisp, American-style bacon, two slices of cheddar cheese, and a thick, fried onion ring. Keeping cool on the side were lettuce, tomato, and pickles. Squeeze bottles of Heinz ketchup and French's mustard were on the table. The buttered, toasted bun was the best I've tasted in town. 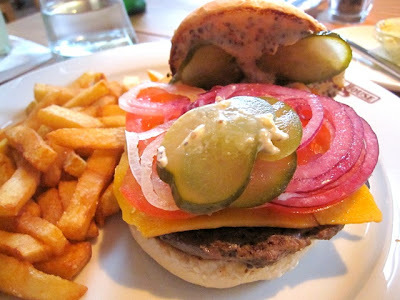 It was rich and brioche-like, yet sturdy enough to handle the burger's heft. Burger buns in Prague usually fall into three camps -- light, wide Burger King-style, thick, chewy Bohemia Bagel-style, or dry crumbly Tesco-style. The Hard Rock's is in a class by itself. The thick, partially-skinned fries that come with it were also among the best I've had. So, there you have it. What burgers have I missed? Which ones have you devoured that you would rank higher? I'd really love to know. I can't hear enough about hamburgers, because like Mr. Kroc, my passion for hamburgers runs pretty hot. Have you tested Lokál Burger? not complex burgers, but quite good. And have you news about the opening of a new Angus Burger or Steak House in Prague? I've heard about the Lokál Burger, but haven't tried (it's a mobile thing, right?). I have no Angus news, sorry. Hi, reading all your blog with great delight and try to sharpen my tastebuds. For relation, as everyone talks about it, where would you put in the Mcd Bigtasty? Between BK an the rest, just curios, thanks.. Completely agree with the number one, expensive but so far the best i've tried in prague. Husa in vinohrady was one of my favs but lately they spoil it, dont know if the change the cook but the burger is totally different for worse that is. The McRib is always available in Germany. Avoiding McDonald's BigTasty is the best thing you could do, no doubt 'bout it. Dressed up like some kind of fancy, honest (if you know what I mean) and - well, as they declare - tasty burger, it send your soul into the endless depths of hell. I would have to stop for a few hours and write down all my recent memories, to recall ANYTHING tasting THAT wrong. 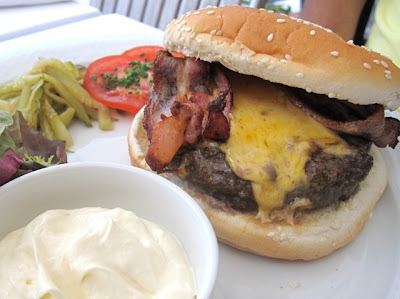 Another fab round up of the burger scene in Prague. I was delighted when I saw this post. Im glad to find someone else who loves burgers as much as me! Im disappointed to see Boho Bagel fall from the number 1 slot. I used to eat there regularly and its one of my first ports of call whenever im back in town. I last ate there in september and the bacon cheese burger hit all the right notes both times I had it. I may also be in the minority but I love the fries. I think they are great with plenty of salt and even a bit of tabasco sauce! Finally the price and service cant be beat. As a long time regular (and probably a healthy tipper too) I was accorded a 10% discount on all my purchases when I was fortunate enought to live in Prague. Now as a returning visitor maybe 3 or 4 times a year, the staff still remember me and give me discount, even after 2 years away. If thats not a nice touch, I dont know what is. Of course, next time Im back, I'll be sure to try Hard Rock too. I might just need to save up a little longer before getting my burger fix! O'Che's burgers and fries are very good.Best Gambrinus in Prague.Lines cleaned after each and every keg...I know as i usually help the cause of changing a keg daily.Very good and cheap lunch menu at fixed price with small beer included. You should try the bacon cheeseburger at Bilá Vrána close to the JZP metrostop. Its brilliant, I prefer them to both Husa and Hard Rock. Great timing. I'm meeting someone in the area this evening. I will try it today! Finally made it to BohemiaBagelia today, not too bad. Smokey flavor that Brewsta is so keen on, good toppings (had the King with mushrooms), american (..) cheese could have been a bit warmer and runny though. Bun is way to thick, I sliced the bottom part in half, which made the whole package fitting in hand and mouth, finally. With the thick, golden cuts from the Hardrock plate I would have been quite happy with the burger, overall. But far away from perfect, have to go the tourist temple sooner or later I guess .. Comparing these great burgers with polystyrene junk from Burger King´s should be taken as an insult to any chief.